The Romans built a fort at Pevensey to deter Saxon raids in c340 AD. 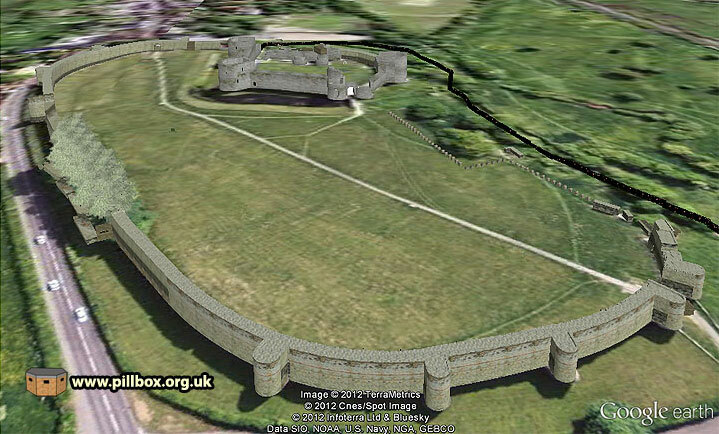 1600 years later, the ancient walls were laced with pillboxes to meet a new Saxon threat. This fascinating mix of ancient and modern defences are now being digitally reconstructed in 3D. I actually began building the model about 18 months ago to include in my talk to the 2011 Sussex Military History Society Study Day. In the event it didn't get used, but I managed to squeeze it into this year's event after it had sat untouched on my computer for a year. 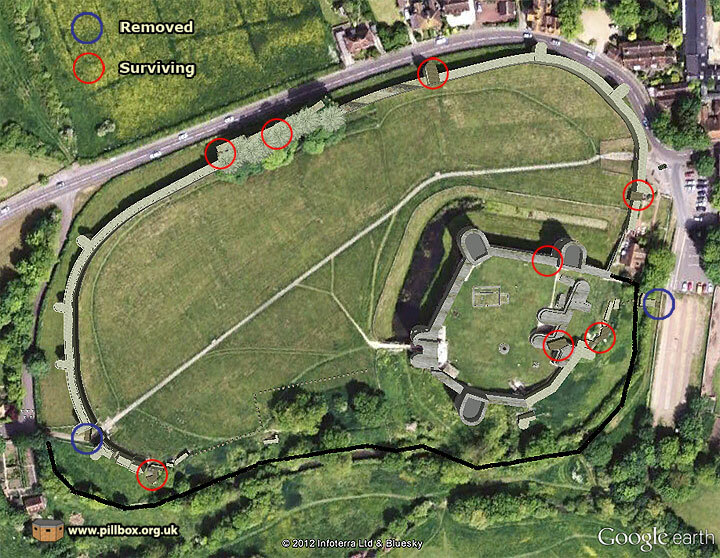 The graphic below shows the extent of the model; the outer wall is the original Roman fort of Anderida. At centre top is the Norman keep that was developed during the two centuries following the Conquest. The model is very much a work in progress, but the reaction to it as I unveiled it towards the end of my talk was such that I decided to video a fly-through and post it in its prototype stage. The graphic at right gives an idea of accuracy; as it's early days, there's still a lot of work to be done. The most time-consuming aspect will be taking my nice square-edged and flat-faced walls and turning them into jagged, ruinous, nondescript masonry. Initial experiments on the Norman gatehouse show this is possible, but will perhaps be the final stage of the process. The other major obstacle will be the contours; Google Earth isn't accurate enough to map the micro-landscape we're looking at and so the ground appears completely flat at the moment. I need to build up contours and raise the ground level in order to make more sense of the southern perimeter defences in particular. 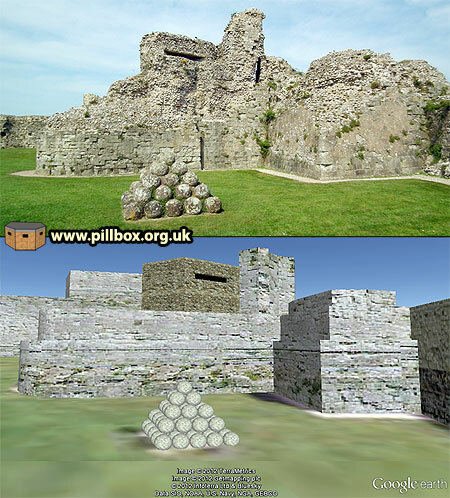 Otherwise, Pevensey Castle is an excellent candidate for my 3D treatment; it was featured in the Defence Areas Project, there is good documentary evidence (and a lot still to be tapped) and only two of the pillboxes have been destroyed since the end of the war. As English Heritage run the castle, it is open to the public who can see pretty much all of the surviving evidence, albeit it from a distance in some cases. All of the pillboxes are sealed up. The model hopefully brings it all to life and points out a few positions and features you may not have previously been aware of! The video features version 1 of the model; as there is much to do, I expect to update it from time to time to include new features.